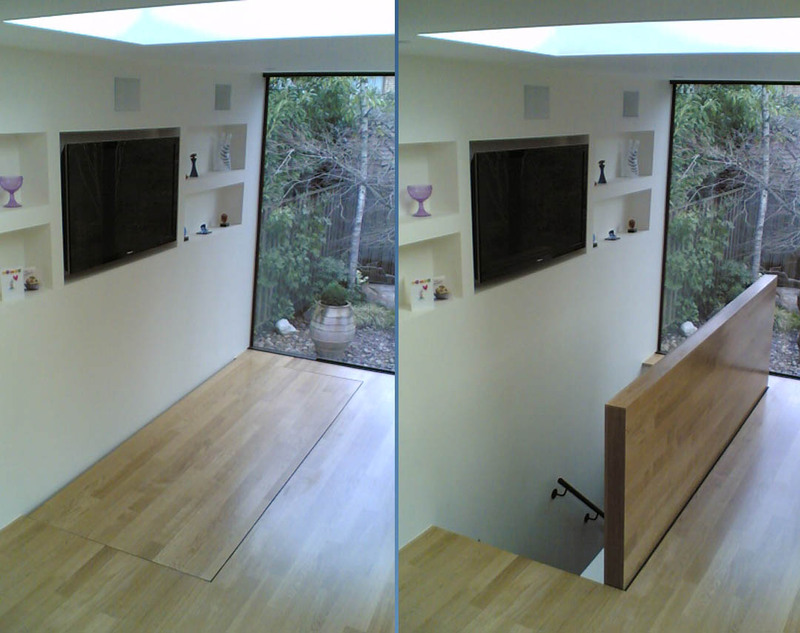 meia designed and installed an automated hinged floor hatch that allows access to the room below. It is finely detailed to give a minimal gap between the hatch surface and the surrounding floor finish. The hatch is clad in the same material as the floor, giving an unobtrusive appearance as a result. Due to the strength it could be fitted with cladding of any weight, including marble, granite or slate, as required. In this instance oak is used throughout. The hinge design allows fine adjustment to make sure the floor finishes align, and maintains a clearance gap of 5mm along the hinged edge of the dynamic element and the static floor whether the unit is closed or open. When open the floor hatch also acts as a balustrade to prevent falls into the stairwell below. The unit can be left permanently open, with occasional periods of being closed, or vice versa. This design uses a pair of very heavy duty gas springs to assist a single electric actuator in opening or closing the 280kg floor hatch in approx. 25 seconds. There is an additional handrail fitted to the underside of the floor hatch to the client’s preference.